While visiting Flicky Island, Sonic notices that the Flckies, his small, feathered friends, were captured and turned into badniks (the robot enemies of Sonic) by Dr. Robotnik in his never ending quest for the Chaos Emeralds, as they live and are able to travel between parallel worlds. Seven levels separate Sonic from the final showdown with Robotnik. 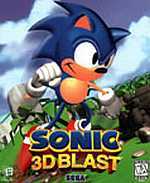 Sonic 3D was the last Sonic title released for the Mega Drive, the only platforming presence of the blue blur in the Sega Saturn and one or the rare presences in Personal Computers. The title, considering the era it was released, is somewhat misleading, as instead of full blown 3D graphics it uses an isometric view where Sonic can move not only forwards and backwards, but also left and right. Gameplay is much slower when compared to other games in the series, and the number of badniks is reduced to five on each section. As usual, when Sonic destroys one badnik, one creature leaps free from it's insides, but this time Sonic has to pick him up and lead them to an interdimensional ring. While they can be taken one by one, exploring the level with all five allow the player to reach for otherwise inaccessible continue tokens. Unlike all other previous games, time isn't a requirement: if the player completes a level in more than 10 minutes, it would only mean there would be no time bonus at the end. Finally, to collect all seven Chaos Emeralds, Sonic first must find Tails or Knuckles and offer them at least 50 rings.